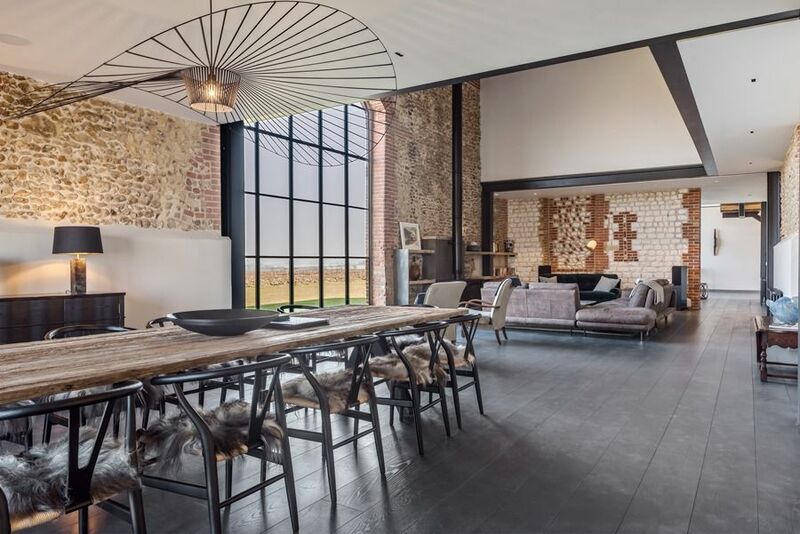 The barn has a wonderful sense of light and space with bespoke full height arched windows and soaring vaulted ceilings with exposed beams and exposed brickwork. 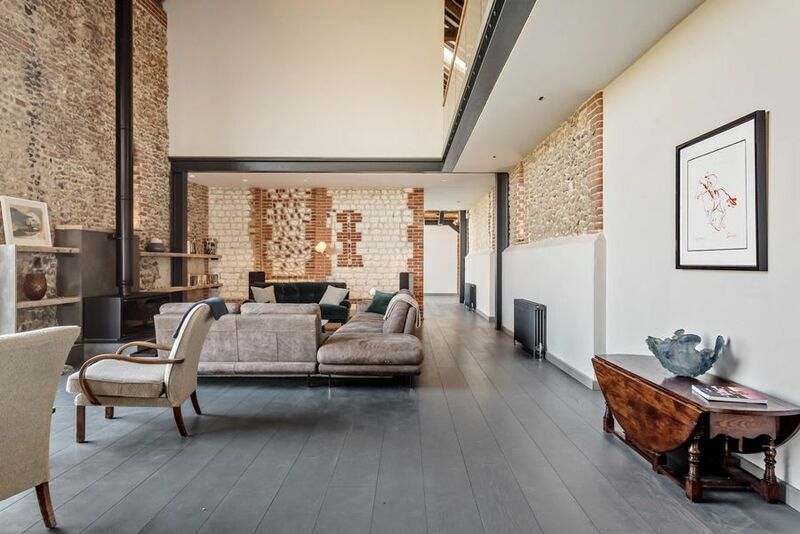 The expansive downstairs space has been cleverly designed to create plenty of different living areas for 14 guests to relax in comfort and enjoy their stay. 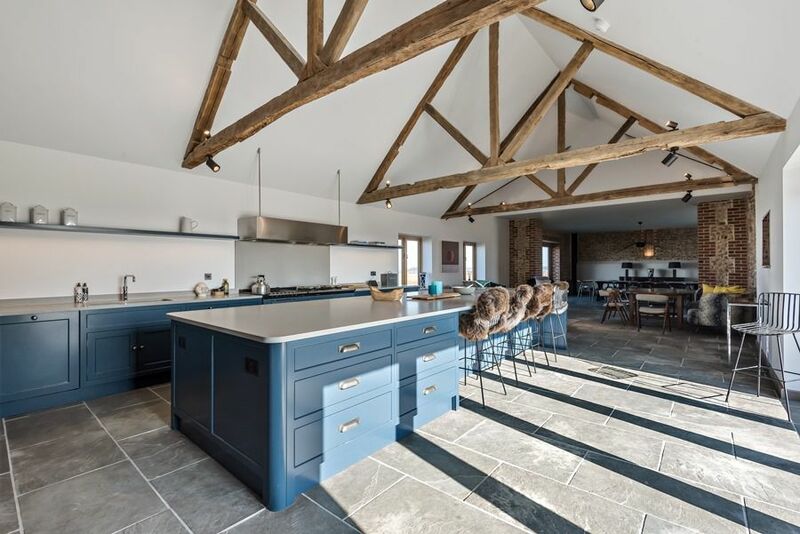 There is under-floor heating throughout the barn with thermostatic controls for each room. There's the advantage of free wifi throughout the barn and a high tech entertainment system (Control4) which is available both inside and outside. Each area can be operated independently to provide radio, or music streamed from the central music library. Entrance hall: Wow! 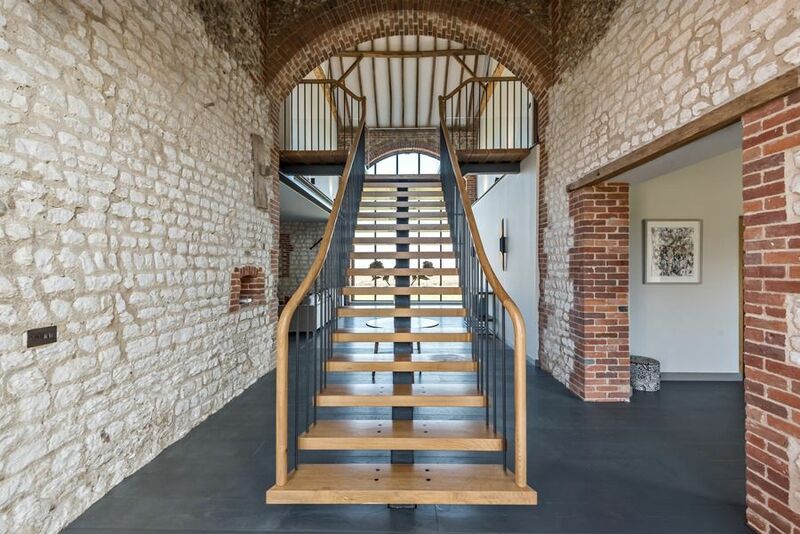 A stunning full height entrance hall with exposed brickwork, original beams and a sweeping bespoke oak staircase. Boot/Laundry Room: a spacious room with a washing machine, tumble dryer, Belfast sink and storage cupboards with plenty of space for coats and boots. Cloakroom: WC with stylish trough sink. Larder: useful walk-in larder which is kept at a cooler temperature. 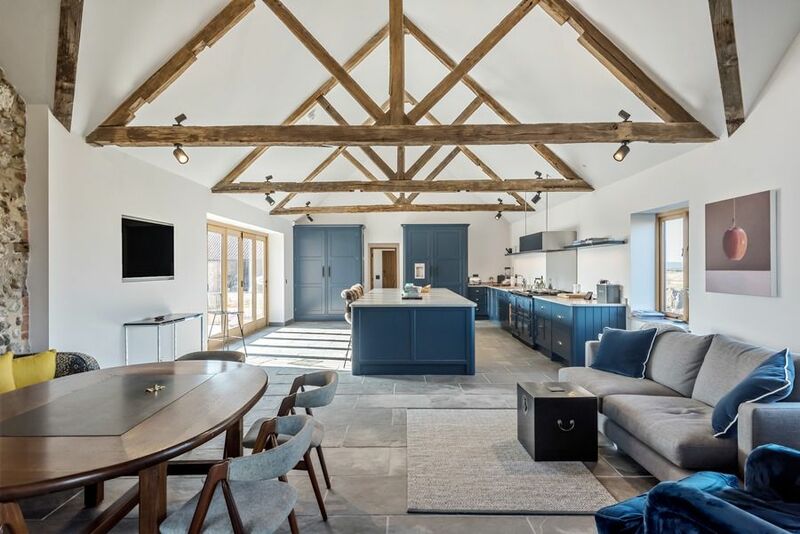 Kitchen/breakfast room: a stunning bespoke hand-built kitchen with a relaxed dining/sitting area at the far end. The fabulous kitchen is finished to an extremely high specification and carefully designed to cater for 14 guests with an integral dishwasher, electric 3-oven Aga with a companion electric 2-oven Aga, integral microwave, huge American style fridge/freezer with ice-maker, separate drinks chiller, coffee machine and a Quooker boiling water tap. There is an enormous central island with caesarstone work top and bar stools. 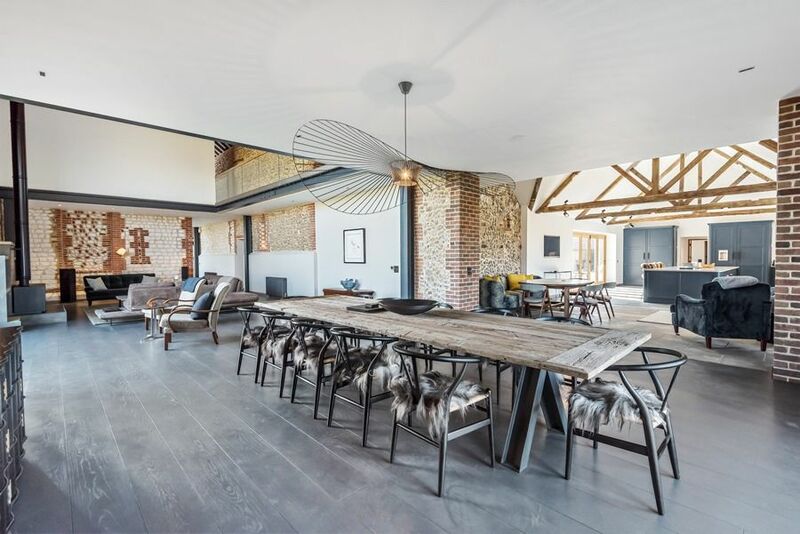 There's a relaxed dining/sitting area with a casual dining table with four chairs and a sofa, more sofas and armchairs and a wall-mounted Smart TV. This whole area overlooks the attractive landscaped walled garden with access via glazed doors. 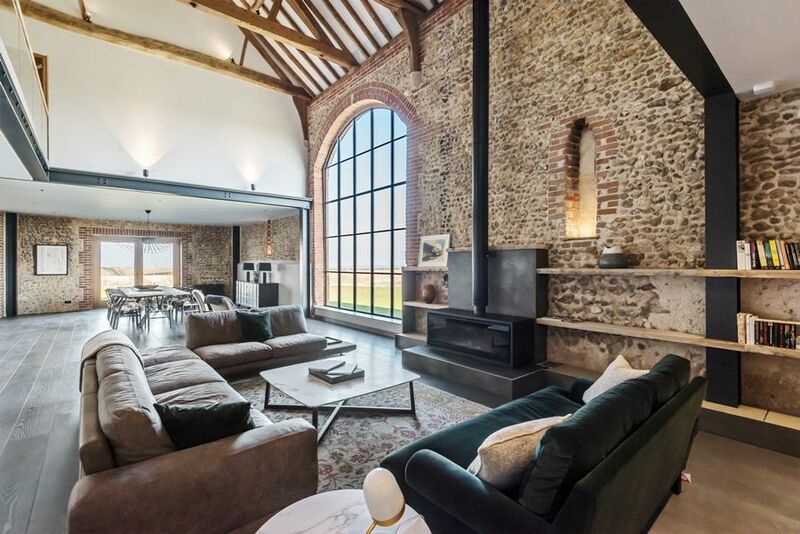 Living Area: a magnificent vast high-ceilinged space with beautifully preserved beams, exposed brickwork, fantastic large wood-burning stove and full height arched windows giving uninterrrupted views across open countryside. 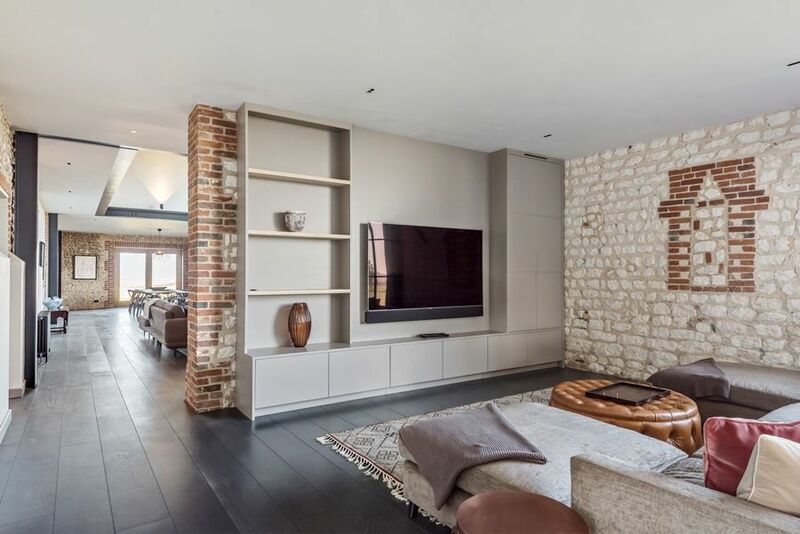 This astounding space has been cleverly divided into distinct zones with plenty of space for sitting, eating or watching TV, all stylishly furnished by its professional interior designer owner, with contemporary seating areas cleverly designed to enjoy the lovely views. 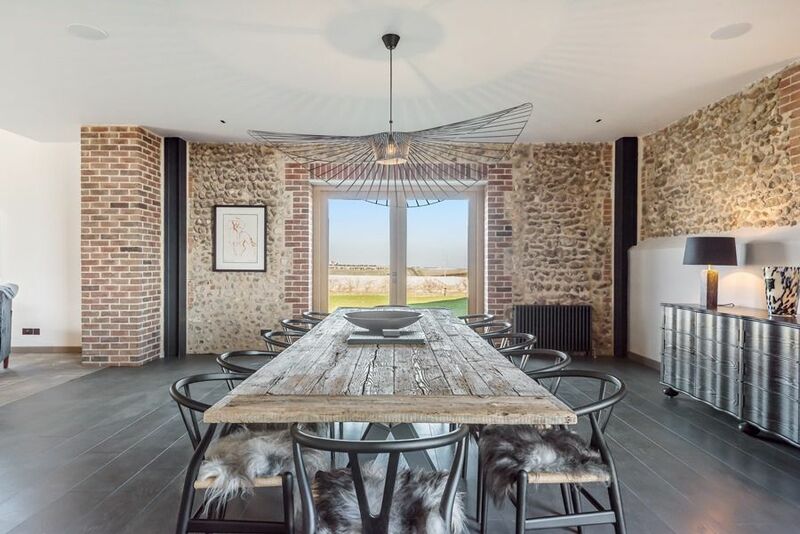 Dining area: has a fabulous bespoke rustic oak long dining table with 14 wrought iron chairs lined with snuggly sheepskins. 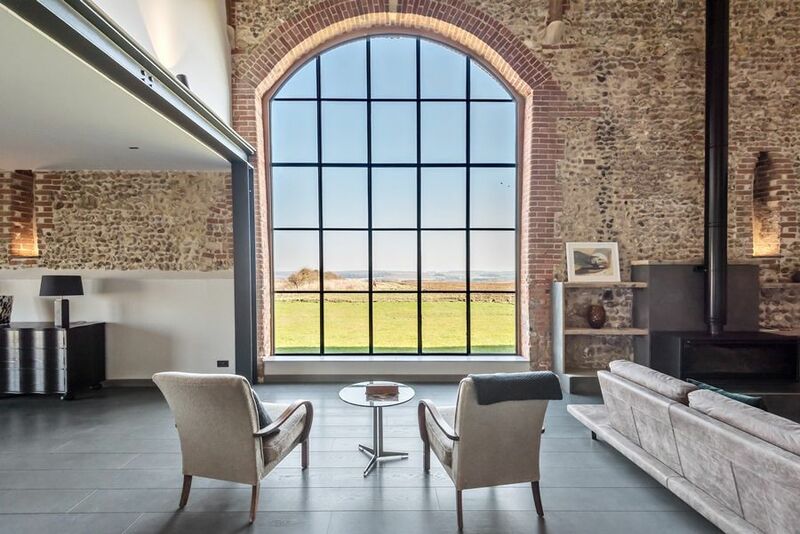 Sitting area: with a fabulous wood-burning stove, big leather sofa, sumptuous velvet sofa and two armchairs positioned for the best views! TV area: at the far end is a large wall-mounted 75” Ultra High definition television with surround sound, Blu-ray DVD player, and Sky Q box (includes Sky movies and sport packages) with DVD player and sound system, with a huge comfy L-shaped sofa - the perfect spot for chilling! 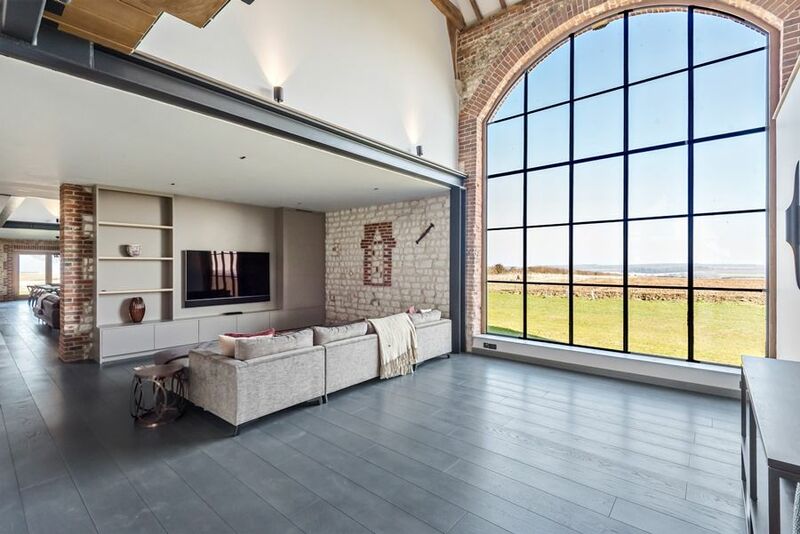 From this superb area there's another fabulous large window. From the living area there is access off to a lovely bedroom wing with two bedroom suites (4 & 5) and a separate cloakroom. All of the bedrooms are luxuriously appointed and have been carefully furnished to ensure guests are comfortable. High quality bed linen and fluffy towels are provided. 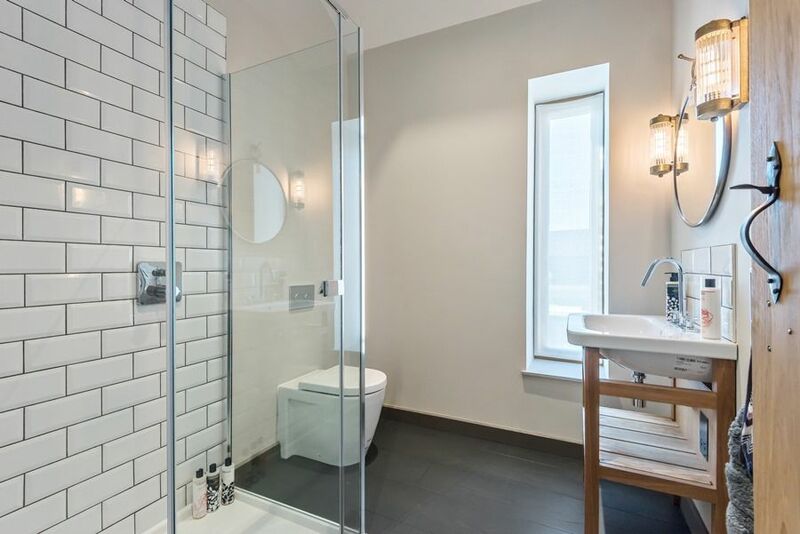 All of the en-suites have high specification bathroom fittings, with the modern heating and water system ensuring that there's always plenty of hot water available. 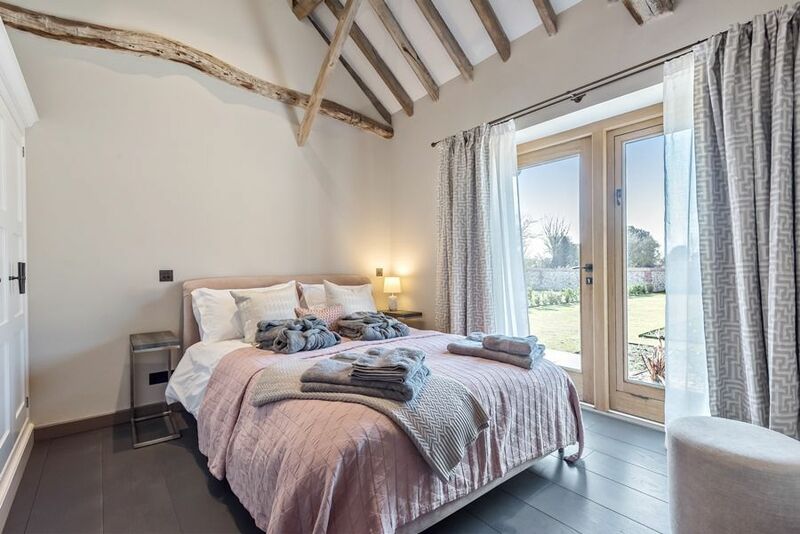 Bedroom Suite 4: beautifully presented room with lovely exposed original beams, a pink upholstered king-size bed, bedside tables and lamps, built-in wardrobe and glazed doors opening out to the walled garden. En-suite bathroom: high quality contemporary bathroom having a copper slipper bath, wash-stand, heated towel rail and WC. Bedroom Suite 5: charming room with a blue upholstered king-size bed, bedside tables and lamps, dressing table, built-in wardrobe and glazed doors leading out to the walled garden. En-suite shower room: contemporary walk-in shower, wash-stand, heated towel rail and WC. Cloakroom: separate loo and hand basin. 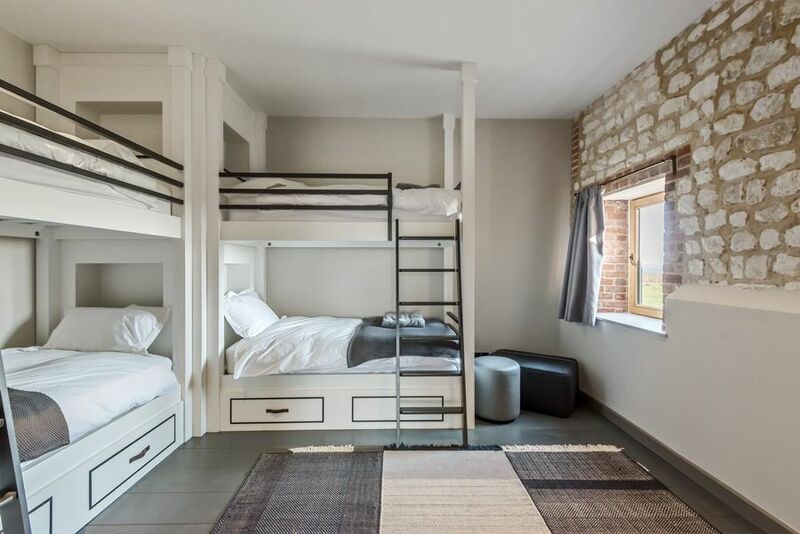 Bedroom 6: a superb room with two sets of hand-made full-size bunk beds, with comfortable mattresses and plenty of head room, carefully designed for adults or children to enjoy a good nights sleep. The bunks have drawers underneath them for clothes storage. There are large built-in wardrobes providing ample storage space for this room. Family bathroom: contemporary room with a bath with fixed overhead shower and a hand-held shower, hand basin, WC and heated towel rail. 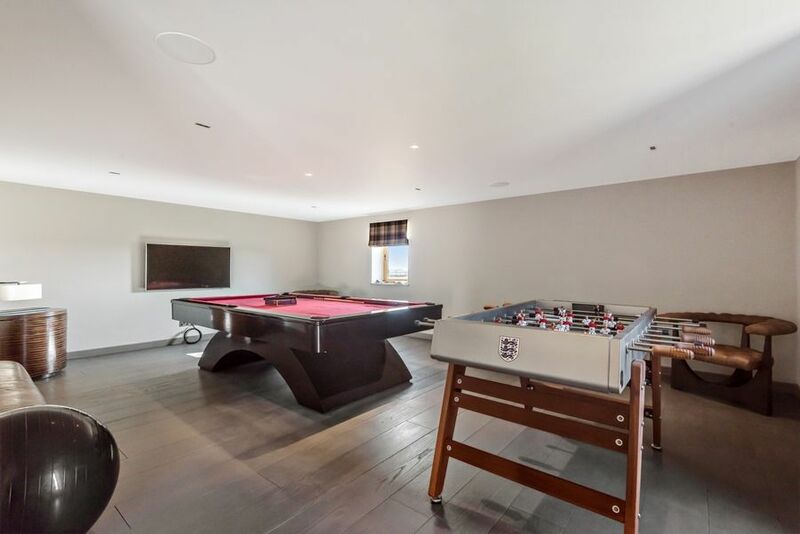 Games room: a fabulous spacious room designed to appeal to all ages with a large American size pool table, table football, large High Definition television, Blu-ray DVD player, Freesat TV and a shared connection to the Living Area Sky box, sofa and comfy bean bags. There is a travel cot and highchair available for use if required. 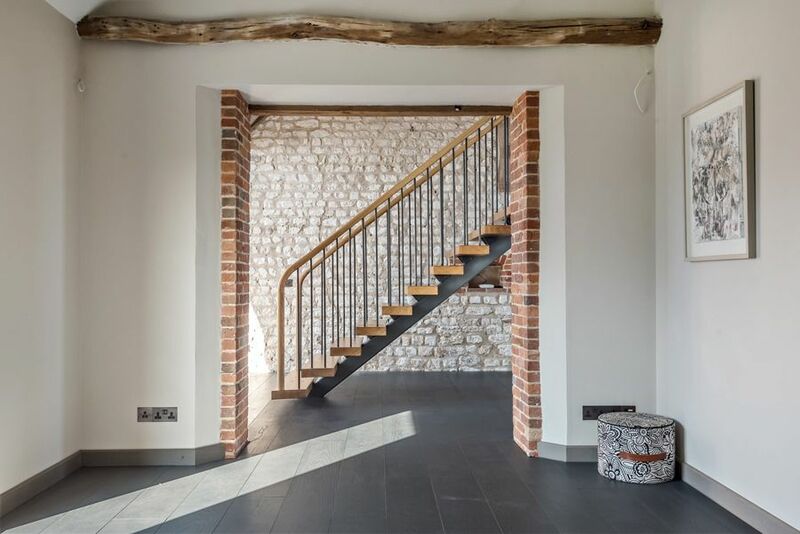 The sweeping bespoke designer oak staircase leads to a fabulous galleried landing with stunning countryside views.Along this landing is a cleverly designed sitting area with breathtaking views. 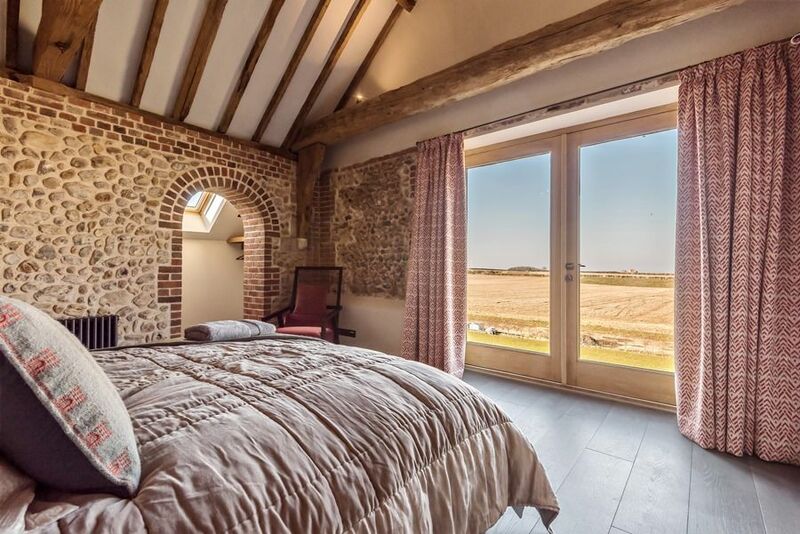 Bedroom Suite 1: absolutely gorgeous room with far reaching views out to the sea, vaulted ceilings with original beams and exposed brickwork. Tastefully furnished with a super king-size bed, bedside tables and lamps, dressing table and chair. En-suite bathroom: stunning with a free-standing copper bath, separate walk-in shower, hand basin, WC and a heated towel rail. Brick arches lead to two back-to-back dressing rooms. 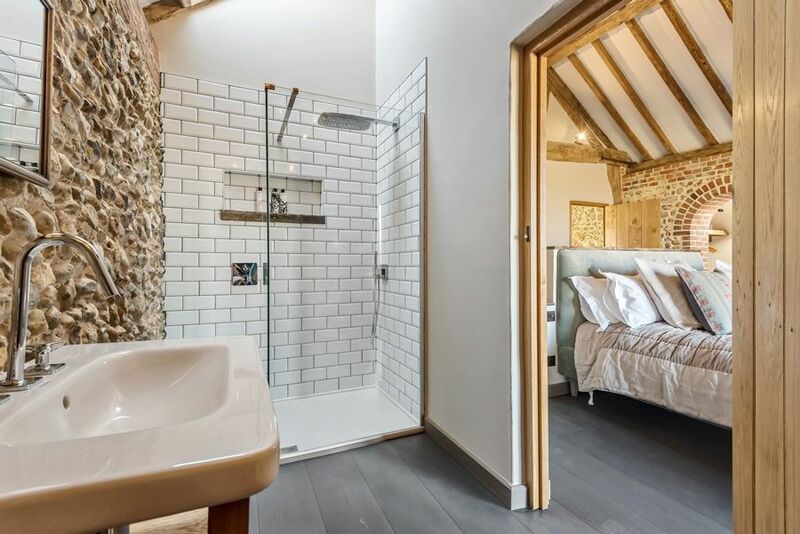 En-suite bathroom with exposed brickwork which has a walk-in shower, large wash-stand, WC and a heated towel rail. 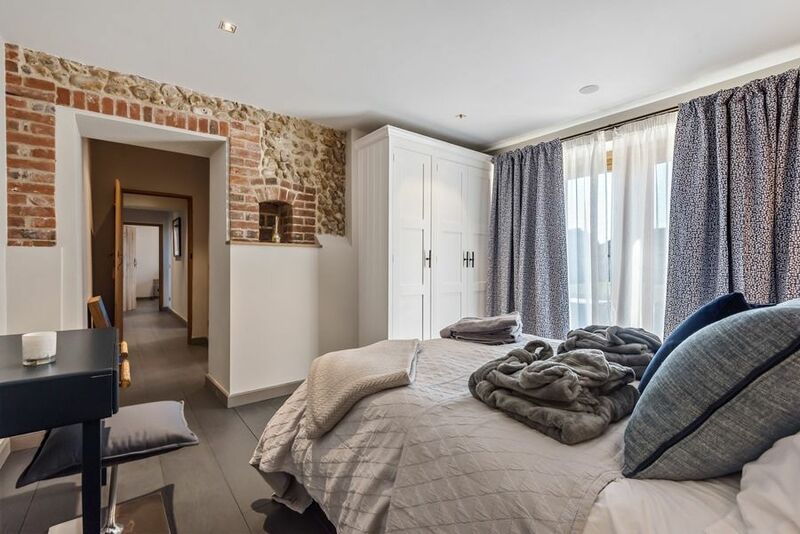 Bedroom Suite 3: lovely spacious room with high ceilings with original oak beams and exposed brickwork. Beautifully furnished with two small double beds (4' each), bedside tables and lamps and built-in wardrobes. En-suite shower room: walk-in shower, wash-stand, heated towel rail and WC. 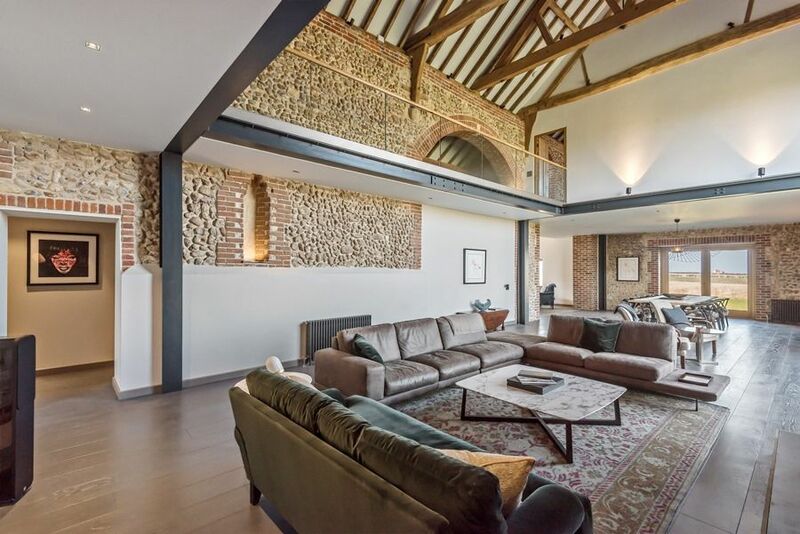 Beacon Hill Barn is located approximately 1.5 miles from Burnham Market's village green and is accessed via a long unmade driveway. Guests are advised that this drive may not be suitable for low suspensions cars. There is ample parking space in the shingle drive for several cars. There is a wonderful wooden hot tub at the property which does not use any chemicals and is completely natural, heated by a wood-burning stove. Please advise at the time of booking if you would like use of this during your stay. (As chemicals are not used, please note that it will require cleaning after 3 to 4 days use, which can be arranged if required). Cart Shed: has a table tennis table. 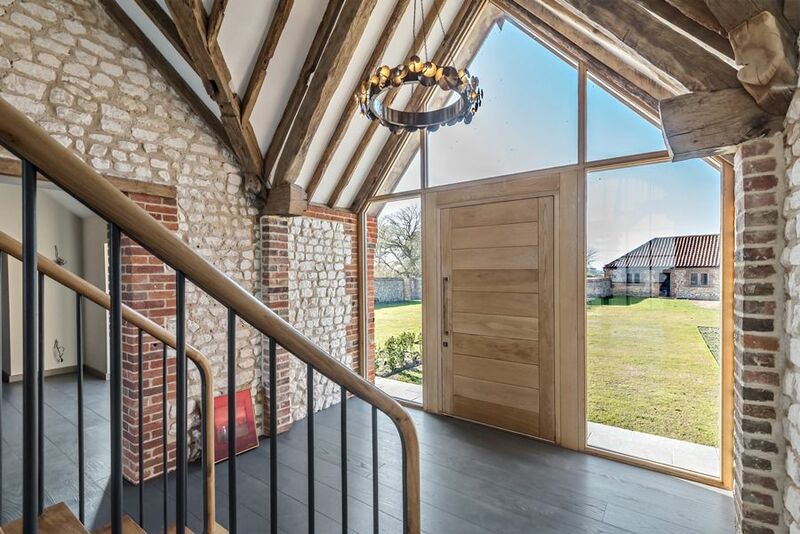 The barn is set in grounds of just over one acre with space for guests to play, rest or dine. 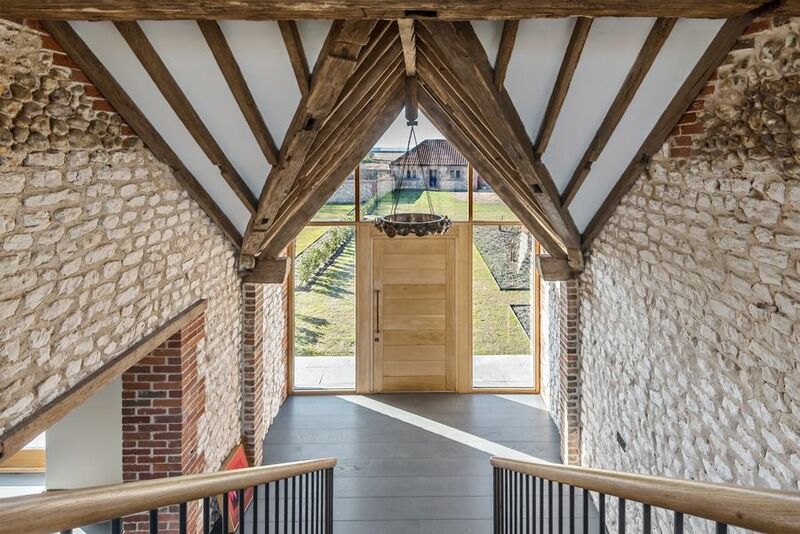 On the South West aspect, a walled and lawned garden has been created to provide a sunny, sheltered outside space perfect for dining alfresco and providing a safe place for small children to play. There is a trampoline which may be used at guests' own risk. The terrace has outside furniture to dine in comfort, with the advantage of outside speakers. 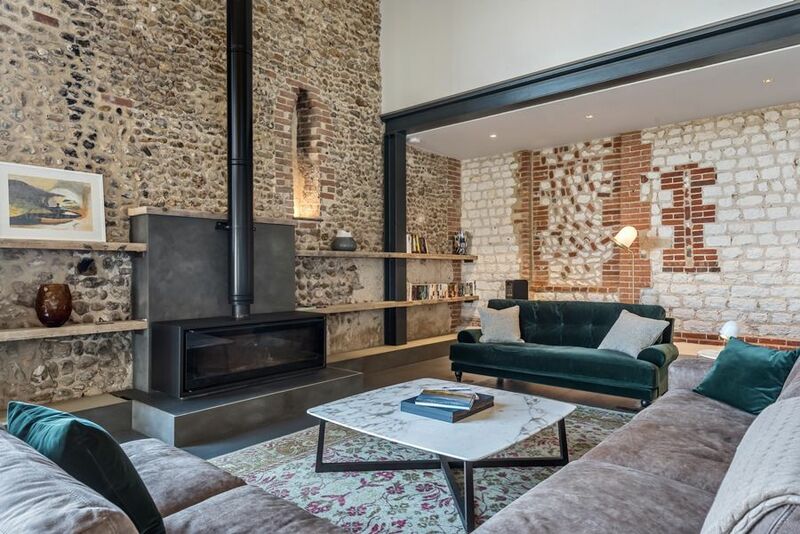 There is a bespoke built-in barbecue area with a pizza oven for guests to enjoy the use of. The remaining grounds are open to the neighbouring fields with plenty of space to run around. Please be aware that dog owners should take care as game birds may prove to be a temptation! 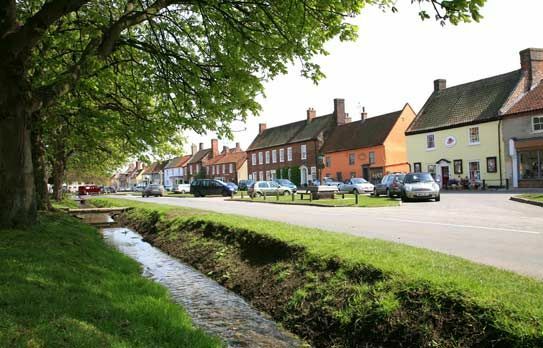 The barn is conveniently located within minutes drive to the picturesque village of Burnham Market with its wide selection of excellent independent shops, restaurants and galleries. 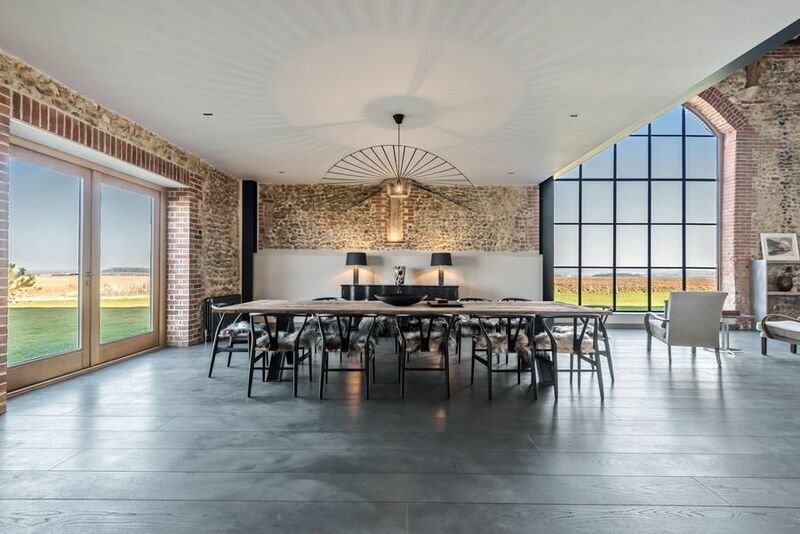 The beautiful North Norfolk coast is easily reached with 10 minutes drive including the traditional fishing town of Wells-next-the-Sea and the renowned beauty of Holkham beach. 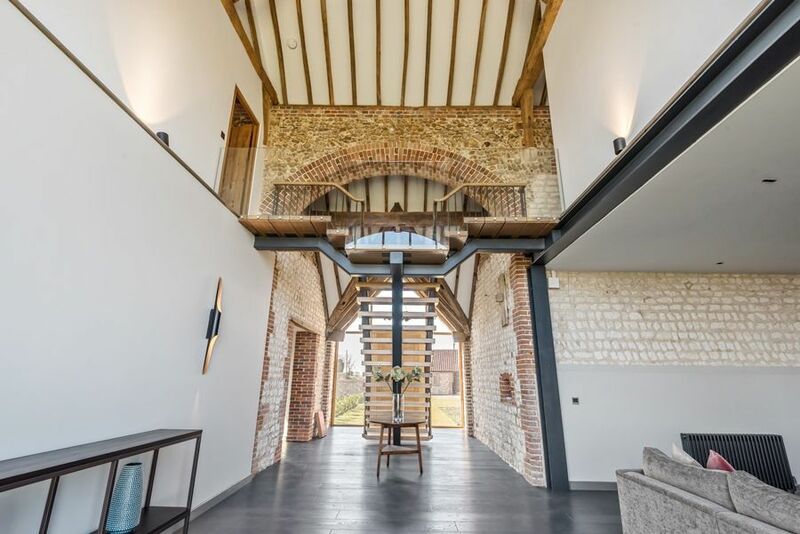 Please note that due to the high quality of the fixtures and fittings, the security deposit for Beacon Hill Barn is £500 (rather than the standard £250). Please note that for corporate lets, VAT will be added to the rental price.